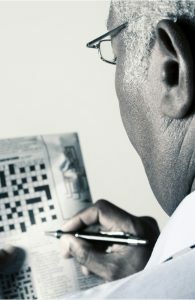 New study answers the question: Do brain games really help stave off cognitive decline? It has become an accepted principle that elderly people can help prevent mental decline as they age by engaging in stimulating activities, such as crossword puzzles and other problem solving games. However, is there any proof for this claim? In a new study from researchers at the University of Aberdeen and the National Health Service (NHS) in Aberdeen, both located in the United Kingdom, along with colleagues from the National University of Ireland in Galway, this question was tested and analyzed. This research was led by Dr. Roger Staff, an honorary lecturer at the University of Aberdeen, and the head of medical physics at Aberdeen Royal Infirmary. The study was published in The British Medical Journal (BMJ). The researchers’ goal was to examine this claim by critically evaluating the effects of problem solving activities on cognitive test performance in the elderly, and noting the trajectory of cognitive test performance over an extended period of time. Using data from nearly 500 participants, all born in 1936, who had each taken the Moray House Intelligence Test when they were 11 years old, the researchers were able to get a baseline of the participants’ intelligence. The data was part of the Scottish Mental Survey of 1947, and stored in the archives of the Scottish Council for Research in Education. At the beginning of the study the participants were all approximately 64 years old. They agreed to provide information about their educational history and mental abilities, and to take additional tests for the next 15 years in order to assess their memory, mental processing speeds and other measurements of cognitive function. The striking conclusion of the researchers — in sharp contrast to the expected result — was that problem-solving activities did not in any way impact the rate of age-related mental decline. On the other hand, it was clearly noted that people who engaged in problem solving activities throughout their life started their decline from a much higher level; consequently their decline was less noticeable as they aged. Although these results may be disheartening, throwing away your crossword puzzles and other games may be both premature and foolhardy. Clearly, the younger and more intensely we become involved in problem solving activities, the higher the point we will start our decline from. On the other hand, perhaps if we put in a little extra effort — maybe a lot of extra effort — it will not be too late to raise our level a bit from where it is now. At Hamilton Grove Healthcare and Rehabilitation Center, in Hamilton, NJ, our care programs are designed specifically to meet the unique needs and interests of seniors and long-term care patients. We emphasize restorative care, maximizing each patient’s potential to regain and maintain function and mobility. We foster an environment that is cheerful and enthusiastic, so residents truly relish and appreciate life. Our outstanding Social Services team works hard to ensure that every resident thrives socially, emotionally, and spiritually. We promote a culture of independence, crucial for emotional, social, and physical health. Residents are encouraged to choose their activity and meal preferences, and to perform tasks and activities as self-sufficiently as possible. We carefully select, train and re-train our wonderful caregivers, who are especially sensitive to the needs of our long-term care patients. They treat residents with love, compassion, and dignity. We are also experts in handling Alzheimer’s and dementias. We have created a unique environment and care program specifically designed to address the needs of this population. Our Alzheimer’s Unit is situated in a separate, secure wing to ensure the safety and well-being of our residents. It offers a structured daily routine, mind-stimulating activities, excellent social interaction, with optimal patient independence in a calm and soothing atmosphere. Read our reviews on caring.com, wellness.com, and senioradvisor.com to hear what our residents and their families have to say. Or better yet, come see for yourself: Contact us to schedule a tour by calling 609-588-5800 or by clicking here. Subscribe to our Hamilton Grove Blog and receive our exciting updates! How Much Exercise You Need to Protect against Alzheimer’s?